I am buying 25mm marbles to use as game components. I also have an Abalone board that should fit nicely with them. I am wondering what other games can be played with these components. seems this would be playable by using another method to substitute for the scoring track. 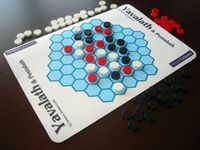 In Yavalath you set one of your remaining game pieces on an empty position on board in alternating manner. 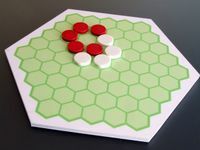 Game starts on an empty board. 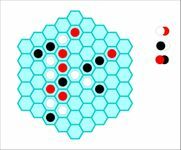 You are instantly winning if four or more of your pieces form a straight line. If just three of your pieces form a straight row before you loose. Actually there is no restriction to max. 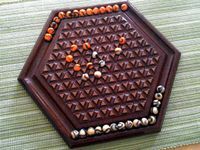 14 game pieces per player (as available in Abalone) but we experienced that most Yavalath games (>99%) end beforehand. 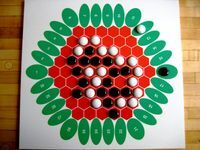 Pure Abalone set can be used for 2 player Yavalath. 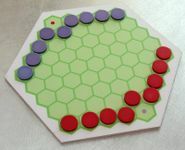 Added a third marble set of different color or the Abalone Quattro version will enable you to play 3 player Yavalath. If your additional marbles form a third color or you own a Abalone Quattro then Yavalanchor is a good candidate to add to your Abalone-material-based game collection. 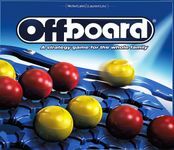 If your additional marbles form a third color or you own a Abalone Quattro then Yavalade is a good candidate to add to your Abalone-material-based game collection, too. Basic version of GIPF is a valid game here, too. 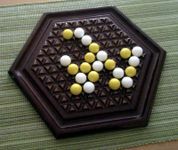 Just use some markers for identification of the different external scoring zones and you can play Offboard using an Abalone set. Not exactly playable with a pure Abalone set since you need 16 marbles of each color. But as far as I know that should not be such an issue to get a few marbles more. Since you mentioned to add more marbles as game components is a valid way to go here is another one. 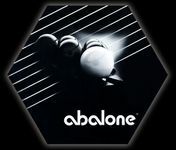 And another one if you use an Abalone Quattro set. 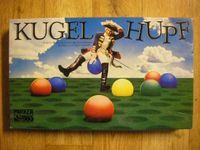 Kugel Hupf is out-of-print at the moment. Anyway it is a whole game collection using exactly these game components. 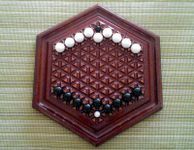 That's some game you might have to play a few times to get its idea. At least I had to... Would be interested in your experience on that one, really!